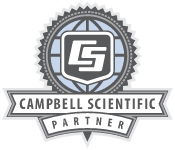 Providence has many years of experience integrating Campbell Scientific's products into sophisticated air monitoring, control and data communication systems. Many of these systems push Campbell's products to their maximum potential and provide our clients with unparalleled performance in the air quality monitoring field. Our ambient and fenceline air monitoring platforms, including both mobile labs and fixed stations, are equipped with Campbell's loggers which allow us to customize the data management system to support a wide range of analyzers, GPS receivers, controllers, and meteorological equipment using various telemetry media. Campbell's LoggerNet SDK software enables us to integrate these loggers into our web-based software package (AIM), enabling users to make fast, informed decisions by providing analytical tools and real time access to air monitoring data. Using the popular MODBUS protocol, our industrial process monitoring systems can be integrated into our clients existing data management system including DCS, SCADA, data Historian, relational database or other OPC servers. Our wide spectrum of expertise and experience in instrumentation, control devices, software development, analytical chemistry and a thorough understanding of the regulatory context allows us to provide an air quality monitoring solution that is optimized to meet the needs of our clients.